After a semester and a half of school goes by and spring break rolls around it’s time for a trip. I was lucky enough to take part in a road/camping trip down the rugged and picturesque California coastline. There were many unforgettable “mental pictures” that I took during the trip but one that I will never forget is the whimsical way jellyfish were portrayed at the Monterey Bay Aquarium. They were floating in front of a bright blue screen, which emphasized all of the vivid colors and fluid shapes each variety of jelly was composed of. Each was very different but beautiful. This series started a new direction for me, focusing on different colors, patterns and textures. 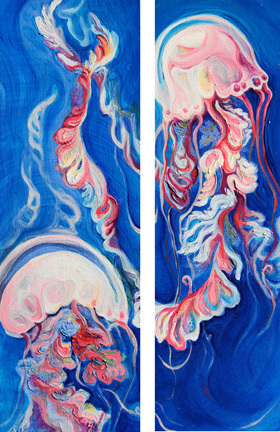 I now look at jellyfish in a new light, how intriguing and marvelous they truly are.